President Trump says that America running a trade deficit means that “jobs and wealth are being given to other countries.” As we explained in Business Insider earlier this month, this statement is logically and historically false. The left-hand figure above shows that the relationship between trade deficits and growth in the United States, going back nearly 30 years, is the opposite. Rising growth tends to increase imports through higher consumption. The imports have not meant that “jobs and wealth are being given to other countries”: they have been a sign of a strong U.S. economy. Still, President Trump is determined to reduce America’s trade deficit through massive new tariffs on steel, aluminum, automobiles, washing machines, and other products. The idea is that if America stops importing such goods, it will start making them here. But with the U.S. unemployment rate at 3.8 percent, an eighteen-year low, there is little if any spare capacity to accomplish this. The capacity would have to be transferred from other sectors. The overall effect of tariffs is therefore to reduce U.S. consumer purchasing power through higher prices—not more jobs, not more growth, not higher net exports. But even this picture is way too rosy. That is because American companies depend on imports to stay globally competitive. Upon losing access to foreign parts, they will lose market share to companies operating abroad that can access them and therefore sustain lower prices and higher quality. 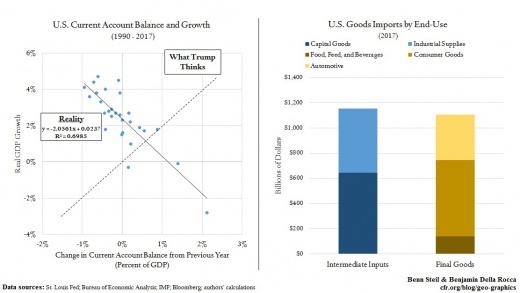 Critically, as the right-hand figure above shows, most imports into the United States are not final goods but intermediate goods—that is, inputs used to make American products, which can then be sold around the world. In fact, nearly all the Chinese exports that Trump singled out for tariffs in April qualify as capital equipment or other inputs. The loss of such inputs is a direct harm to U.S. companies. Trump trade advisor Peter Navarro does not believe this. 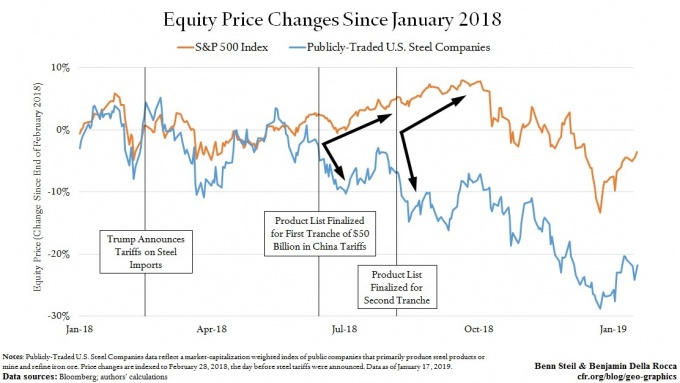 “It does the American economy no long-term good,” he said in January, when its firms are “assembling ‘American’ products that are composed primarily of foreign components.” But this is nonsensical. Whether an American product is made “primarily” with U.S. or foreign components tells us nothing about whether tariffs are beneficial. An American product may simply be impossible, or too costly, to make without those components. And we know, in fact, that Navarro understands this. That is because he has defended U.S. penalties against Chinese telecom equipment manufacturer ZTE, which have cut it off from U.S. suppliers. ZTE is so dependent on U.S. computer chips that its operations have been brought to a standstill by U.S. sanctions. Navarro thinks ZTE can’t survive without foreign components. So why does he think U.S. firms are different?